Mainstream press have been very supportive of the Quakebook project, helping to bring the story of the 2:46 Quakebook Book to the attention of many around the world. (See below). Are you a reporter or journalist looking for a story? Please help to make the QuakeBook a success by writing about this collaborative, international project. For more information please contact Our Man in Abiko (Japan) or Dan Ryan (North America). Tokyo, Japan — The Amazon-bestselling ebook 2:46: Aftershocks: Stories from the Japan Earthquake, which has raised tens of thousands of dollars for Japan’s earthquake and tsunami victims and is known on Twitter as “#quakebook”, is now available in an English-language paperback edition and a bilingual print edition. The English and Japanese bilingual version, available in Japanese bookstores and via Amazon.co.jp, is priced at ¥1,400 and includes a new foreword by Japanese scientist Kenichiro Mogi. Tokyo publisher Goken Co., Ltd. is donating all profits to the Japanese Red Cross Society. The English-language paperback edition, available via Amazon.com, is priced at $11.99 and publisher Amazon is donating to the Red Cross the entire purchase price of the first 3,600 copies sold, after which it will donate all profits, deducting only print costs. The book will also be available soon via Amazon.de and Amazon.co.uk. 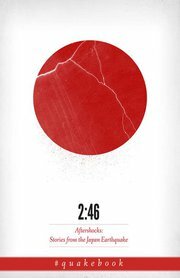 The ebook edition of 2:46: Aftershocks: Stories from the Japan Earthquake has raised over US$30,000 to date, and to coincide with the release of the print editions, is now free through Amazon.com, with downloaders encouraged to donate to the Red Cross earthquake and tsunami victims fund. Several days after the earthquake and tsunami, Our Man put out a call on his blog and via Twitter for art, essays and photographs that reflected first-person accounts of the disaster to be edited into a book with all the revenues going to the Japanese Red Cross Society. Within 15 hours, he had received 74 eyewitness submissions from all over Japan, as well as reactions from elsewhere in Asia, Europe and North America. In just over a week, the book had been edited, designed and laid out by a team of contributors from all over the world, most of whom had never met in person. In addition to narratives by journalists and people who braved the disaster, 2:46: Aftershocks: Stories from the Japan Earthquake contains writing created specifically for the book by authors William Gibson and Barry Eisler as well as artist and musician Yoko Ono. For more information about 2:46: Aftershocks: Stories from the Japan Earthquake, please visit the website , Facebook page and Twitter account . Tokyo, Japan — In just over a week, a group of professional and citizen journalists collaborated via Twitter to create a book to raise money for Japanese Red Cross earthquake and tsunami relief efforts. The book will be available for download via Amazon’s Kindle and Sony’s Reader ebook platforms within several days. One hundred percent of revenues will go to the Japanese Red Cross Society. The 98-page book, titled 2:46: Aftershocks: Stories from the Japan Earthquake and known on Twitter as “#quakebook”, is the brainchild of a Briton who lives in the Tokyo area and blogs under the pseudonym “Our Man in Abiko”. A few days later, he did think of something. The former journalist put out a call on his blog and via Twitter for art, essays and photographs that reflected first-person accounts of the disaster. He decided he would edit them into a book and donate all the revenues to the Japanese Red Cross Society. Within 15 hours, he had received 74 eyewitness submissions from all over Japan, as well as reactions from elsewhere in Asia, Europe and North America. In addition to narratives by journalists and people who braved the disaster, 2:46: Aftershocks: Stories from the Japan Earthquake contains writing created specifically for the book by authors William Gibson, Jake Adelstein, and Barry Eisler, as well as a piece by artist and musician Yoko Ono. With the book completed, the project team turned again to social media. In a matter of days, they created a website http://www.quakebook.org, Facebook page http://www.facebook.com/Quakebook and Twitter account (@quakebook). The project quickly got attention from Twitter users like Yoko Ono as well as tech, publishing, and Japan-centric blogs. “Twitter has been an amazing collaboration tool,” says Our Man in Abiko. “A few tweets pulled together nearly everything – all the participants, all the expertise – and in just over a week we had created a book including stories from an 80-year-old grandfather in Sendai, a couple in Canada waiting to hear if their relatives were okay, and a Japanese family who left their home, telling their young son they might never be able to return. For further details, please contact Roberto De Vido (Japan) or Dan Ryan (North America) at the email links shown above. 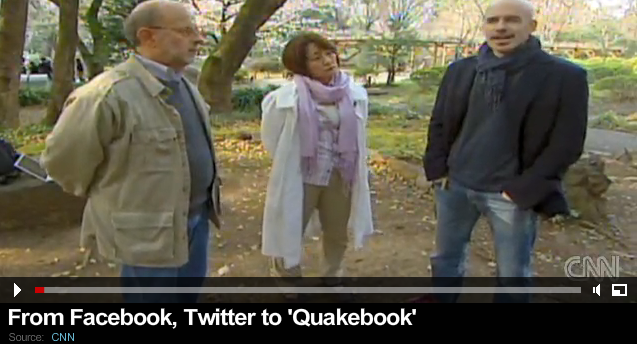 (If you find #QuakeBook media coverage, please do let us know. Thanks). Quakebook editor, Dan Ryan, speaks to IndieReader. You can’t get better than this! Twitter has tweeted about Quakebook. Without Twitter, it would have been far harder to bring together this type of collaborative book project. Good and bad in Japan – Quakebook – Quakebook is good! A piece by Jared Keller at The Atlantic. Buzz in the blogsphere for Quakebook is getting off to a very prestigious start.